The Soothing Touch Soap is a small batch, handcrafted soap made with oils and butters that are natural, sustainable, organic whenever possible, stable, and full of nourishing nutrients. Each batch of soap gets its mild color from the use of herbal infusions and it is scented with 100% pure, high quality essential oils that contribute beneficial aromatic and regenerative properties to the final product. There is really so much skin nourishing goodness in each bar of soap. 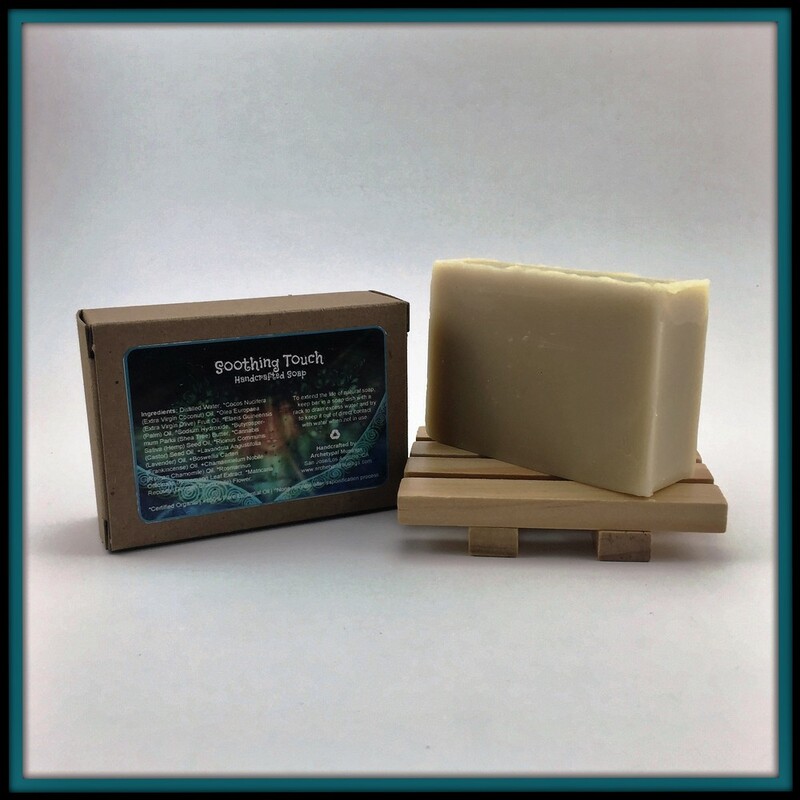 Soothing Touch Soap was inspired by the energy of a soothing embrace. This archetypal soap calls forth the calm and gentle touch of the Divine that renews and soothes mind, body, and spirit. Lavender EO+ is soothing and calming. It's aroma may promote love, peace, communication, and a sense of well-being. It assists in cell renewal and reduces scarring. Frankincense EO+ increases spiritual awareness. It's gentle aroma may elevate one's mood, providing a sense of balance. As a wonder oil for the skin, it may help prevent or reduce scaring. Roman Chamomile EO+ is calming and relaxing. It's aroma may be used to soothe and clear the mind and to help stabilize emotions. It can help create an environment of peace and patience. It also assists in skin regeneration. German Chamomile* Water Infusion - German Chamomile tea is extremely soothing and nourishing to sensitive skin. It increases the ability of the skin to regenerate and its aroma can stabilize and release emotions. Extra Virgin Coconut Oil* is a powerful moisturizer that helps in the restoration of dry skin. It helps to strengthen skin tissue, may reduce inflammation, and locks in moisture. Extra Virgin Olive Oil* is rich in vitamin E. Because of its nutrient packed composition, it tends to improve skin's elasticity at the same time that it strengthens it. Olive oil can keep skin feeling supple and even assist in calming irritation. Palm Oil* contains the hard to find, powerful antioxidants, toctrienols. Because of this, palm oil is able to penetrate deep into the skin’s layers to stimulate healing and protection from within. It has the ability remove oil and dirt from hair and skin. An although it assists in cleansing, it also provides deep moisturizing to the skin, keeping it soft and supple. Sodium Hydroxide (Lye)^ creates the chemical process that turns oils and butters into soap. Archetypal Musings uses a pure, food grade lye to ensure the high quality of the resulting soap. Shea Butter* is deeply moisturizing with a high content of vitamin A. It works to soothe dry, thirsty skin, and has the ability to assist with a variety of skin ailments. Hemp Seed Oil* is rich in essential fatty acids which can assist in preventing moisture loss in the skin. It can also be effective in maintaining moisture balance and in alleviating certain skin conditions. Castor Seed Oil* has anti inflammatory and antibacterial properties. It's fatty acids can penetrates deep into the skin tissue providing much nourishment. Rosemary Leaf Extract* is a powerful anti-oxidant. It helps to protect against free radical damage and the effects of environmental stresses on the skin at the same time that it assists in maintaining the freshness of cold pressed oils and butters. To extend the life of natural soap, keep bar in a soap dish with a rack to drain excess water and try to keep it out of direct contact with water when not in use. The Calming Touch Soap is a small batch, handcrafted soap made with oils and butters that are natural, sustainable, organic whenever possible, stable, and full of nourishing nutrients. Each batch of soap gets its color from the use of herbal infusions and it is scented with 100% pure, high quality essential oils that contribute beneficial aromatic and regenerative properties to the final product. There is really so much skin nourishing goodness in each bar of soap. Calming Touch Soap was inspired by the desire to embody peacefulness, be that peace of mind, heart, or spirit. When there is peace within one self, just like a child, we experience the excitement of new discovery and possibility and welcome the soothing innocence of spirit. Lavender EO+ is soothing and calming. It's aroma may promote love, peace, communication, and a sense of well-being. Coriander EO+ may assist during times of stress, irritability, or nervousness, and as such, it has a calming and relaxing influence. Its aroma encourages to honor and live from a place of self-acceptance and love. Ylang Ylang EO+ is calming and relaxing. It balances female and male energies. Its aroma may bring back feelings of self-love, confidence, and joy and may influence sexual energy. Lavender* Water Infusion - Lavender tea has a soothing aroma that promotes relaxation. It is known as an overall body balancer and promotes an overall sense of well being. It may also help with a variety of skin conditions. The Peaceful Warrior Beard Balm is a gentle, smooth balm, handcrafted with high quality ingredients to help soften, condition, and repair facial hair. It helps lock in moisture, stimulates new growth, and is a styling agent. Embodied Man also conditions the skin, potentially alleviating the itching caused by new growth. The Peaceful Warrior embodies masculine physicality and a zest for life at the same time that he carries powerful, life-sustaining action. His actions are firm, assertive, protective, grounded, and mindful. He guards the Earth and her children. Rosewood EO+ calms the mind and relaxes the body. It creates a feeling of peace and gentleness. Through its gentle support, Rosewood EO creates a greater connection between the soul and the physical body. Lime EO+ has a refreshing, elevating, and stimulating fragrance that helps to overcome exhaustion. It's aroma revitalizes the heart, opening the space for lightness and joy. Copaiba EO+ is an anti-inflammatory with many uses. It is believed to enhance the effects of any other essential oil. Its aroma can elevate one's mood, promoting the stabilization of emotions. Cedarwood EO+ is the oil of community as it brings people together. Its aroma inspires the feelings of belonging. It has a calming effect, thus opening the heart and releasing anger. Patchouli EO+ supports individuals in feeling present in their physical bodies. Its aroma is sedating and relaxing. It may have some influence in an individual's physical expression and sexuality. Hawaiian Sandalwood EO+ calms, harmonizes, and balances emotions. It assists in opening one's heart to accept others. It teaches humility, devotion and facilitates a greater alignment with the Divine. Vanilla Absolute Blend helps calm and normalize emotions, particularly during times of high stress. It helps to relief tension and uplifts one's mood. It calms and relaxes mind and body. Cocoa Butter* is high in fat, allowing it to deliver deep nourishment and moisture to the skin. Mango Butter is an emollient rich moisturizer that contain vitamins A, C and E.
Beeswax is antibacterial, anti-inflammatory and contributes to softening and re-hydrating dry skin due to its rich vitamin A content. It forms a protective barrier on the skin’s surface, still allowing it to breathe. Beeswax is also what gives a beard balm its hold. Jojoba Oil* closely mimics human skin sebum and it is easily absorbed into the skin. Sweet Almond Oil* is thin and light. It flows well on the skin. Reduces skin inflammation, which can help prevent ingrown beard hairs. Extra Virgin Rosehip Oil offers several benefits to the skin due to its primary constituents: essential fatty acids, vitamin E, vitamin C and B-carotene, a form of vitamin A. It has the ability to penetrate into deeper layers of skin and stimulate collagen production. All the butters in the Peaceful Warrior Beard Balm recipe contribute to its smooth spreading texture. The Embodied Man Beard Balm comes in an amber jar intended to protect its nourishing and delicate constituents. It is currently available in 2 oz quantities. Please visit the MARKETPLACE to purchase.